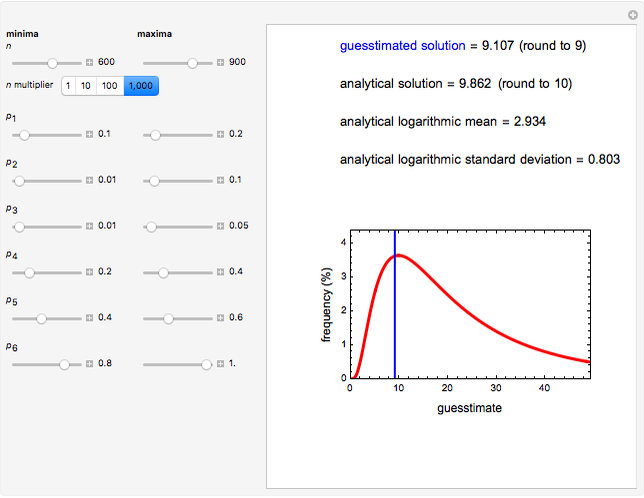 In "risk guesstimation", the magnitudes of the guessed factors are multiplied to find an estimate. In this Demonstration, each factor's guessed value is the geometric mean of the lower and upper limits of its probable range. The result is compared with the analytically calculated value based on the assumption of uniform probability distribution within each factor's range. 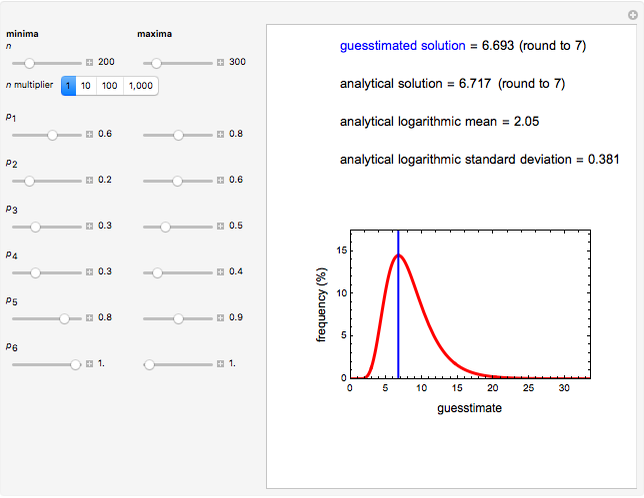 The analytical result is the mode of the displayed lognormal distribution expected from the central limit theorem. A simple "back-of-the-envelope" calculation method also known as a "Fermi problem"  or "guesstimation"  is based on multiplying the estimated or guessed values of several factors. The method frequently works because if the factor guesses are "reasonable", it is unlikely that all or even most of them will differ considerably from the correct values. Thus, due to mutual compensation, their product would be close to the actual value. The method can be applied to estimate the number of food poisoning victims of spoiled food product units , using the formula , where is the number of affected persons (e.g. a restaurant's guests) or the number of food items not yet consumed, and the are the chain of probabilities (e.g. of a customer eating the infected dish , of consuming a large enough quantity of it , of being in poor health , etc.). In some cases, coming up with reasonable guesses for and the can be difficult, and different experts might choose differently. It would be much easier, however, to identify these factors' probable ranges, such as and , and , and , etc. and run Monte Carlo simulations to extract the most probable value of , which can also be calculated analytically . It can be and has been shown that when the factors are multiplicative, the distribution of the generated 's is approximately lognormal, as expected from the central limit theorem (CLT) . The mode of this distribution is the best estimate of , and it was found to be in agreement with the value calculated analytically, based on the assumption that the factors have uniform distribution within their respective ranges . In this Demonstration we have replaced the Monte Carlo simulations in the original version of the expanded Fermi solution with single parameter values calculated as the geometric mean of their upper and lower limits , that is, . Use the sliders to enter the parameters' minimum and maximum values. 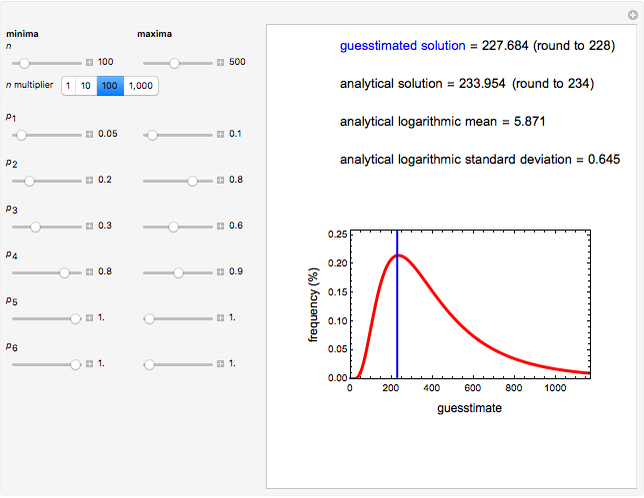 The calculated value is displayed together with the value calculated analytically with the formulas written by Horowitz . Also shown is the theoretical lognormal distribution of generated with the analytically derived logarithmic mean and standard deviation. Notice that the guesstimation method based on the parameters' geometric means becomes totally impractical whenever any of the entered values of the lower limits is zero, rendering a zero guesstimate regardless of the other factors' magnitudes. The same is true whenever any of the entered values of the lower limits is close to zero relative to their corresponding upper limit, in which case the geometric mean would again be unreasonably small. L. Weinstein and J. A. Adam, Guesstimation: Solving the World's Problems on the Back of a Cocktail Napkin, Princeton, NJ: Princeton University Press, 2008. M. Peleg, M. D. Normand, J. Horowitz, and M. G. Corradini, "An Expanded Fermi Solution for Microbial Risk Assessment," International Journal of Food Microbiology, 113(1), 2007 pp. 92–101. doi:10.1016/j.ijfoodmicro.2006.07.020. Mark D. Normand and Micha Peleg "Risk Guesstimation from Factor Ranges"